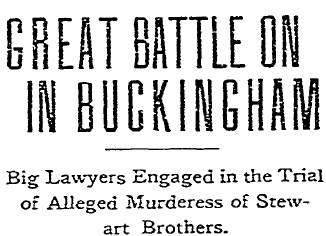 The 1909 Buckingham Murders: Part VIII | slate river ramblings . . . .
Unsurprisingly, Dallas Wright’s attorneys questioned whether or not an unbiased jury could be found in Buckingham County and approached presiding Judge Gordon for a change of venue which would allow Wright to be tried in another county. If Judge Gordon refused, The Times-Dispatch reported that counsel for the defense would likely request a continuance, delaying Wright’s trial. While Dallas Wright awaited trial, the case developed a new wrinkle. Deputy Sheriff J. E. Carter, who had gathered the initial evidence against the accused men and “caused” their arrest, met with an accidental death following Edward Jones’ trial. Attorney Hubard insisted this was not material to Dallas Wright’s upcoming trial. Surely some citizens in Buckingham County continued to wonder. . . .
Today’s twist is pretty exciting. Isn’t it?